Have you noticed that my blog design is new? I made the change a few months ago without much fanfare. Many of you read this blog via email and RSS readers. I’m guessing some of you have never clicked on the link to actually see the new look of the blog. My encouragement to you this day is to click on the link and open this post in your browser. 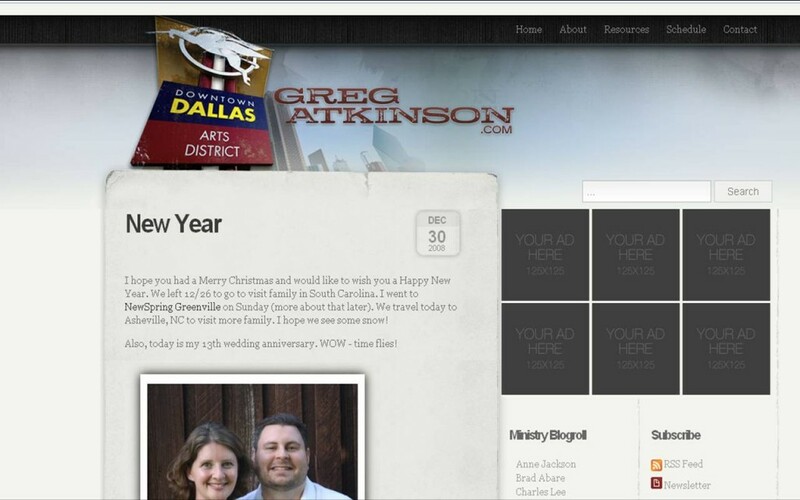 This new blog look is a custom-designed theme by my friend, Ben Jordan. Ben and I worked on this for a while behind the scenes and then made the switch. Some of you may have been receiving the old ChurchVideoIdeas.com Feedblitz email and may need to sign-up again for the new GregAtkinson.com feed. I purposely changed the name from ChurchVideoIdeas.com to GregAtkinson.com? Why? Because I blog about Â a lot more than church video and didn’t want to be pegged as tech-only. The major themes of this blog are and will be innovation, technology, social justice, ministry and leadership. The sponsors are much more noticeable now and you are encouraged to click on their ads and visit their websites. These sponsors are a huge part of my ministry and their support allows me to be able to travel across the country and host seminars like the Church 2.0 Local Forums where attendees can come for free. The sponsors you see listed are all worth taking a hard look at what they offer for your church or ministry. On the right-hand side you can also sign up for my newsletter. I don’t send one out often, but I’m sure you’ll want to read it when I do. Two new sections to the blog (seen in the top-right corner) are my speaking schedule (so you can see if I’m coming to your neck of the woods or speaking at a conference you may be attending) and a resource section. I’m excited about being able to offer various resources in this new section.Â Today’s blog is the first time I’ve put something in the resource section.Â You may have noticed the custom-made social media/network icons on my new blog. The designer, Ben Jordan, and I have put them (plus other ones) in a downloadable zip package for you to use on your own blog or website. That’s right, we’re giving them away. Take and use them however you like. Also in the resource section (coming in the future) will be eBooks and audio and video resources. I may make some of my teaching available, as well as videos that I create just for my readers. Their may be other downloadable resources like I used to offer on MultisensoryWorship.com, including preaching resources and worship resources (new songs and chord charts). Please note: My vision is to not just offer my own resources, but other quality resources as well. I’ll be asking people I respect to let me offer their resources (songs, eBooks, downloads, etc.). If you have something that you think would fit in this category, email me at greg@gregatkinson.com and let me know.